One of my co-workers recently brought in a food item they’d ordered online. I happened to catch a glimpse of it walking by their desk, this Ambrosia Honey manufactured and distributed by Madhava Naturally Sweet. Before getting into the product, I love the meaning behind and consistent thread from the foundation to the product and packaging itself. “Madhava is a Sanskrit word meaning “Born of Honey;” it is derived from the Sanskrit word madhu which means “sweet”.” Perfect! 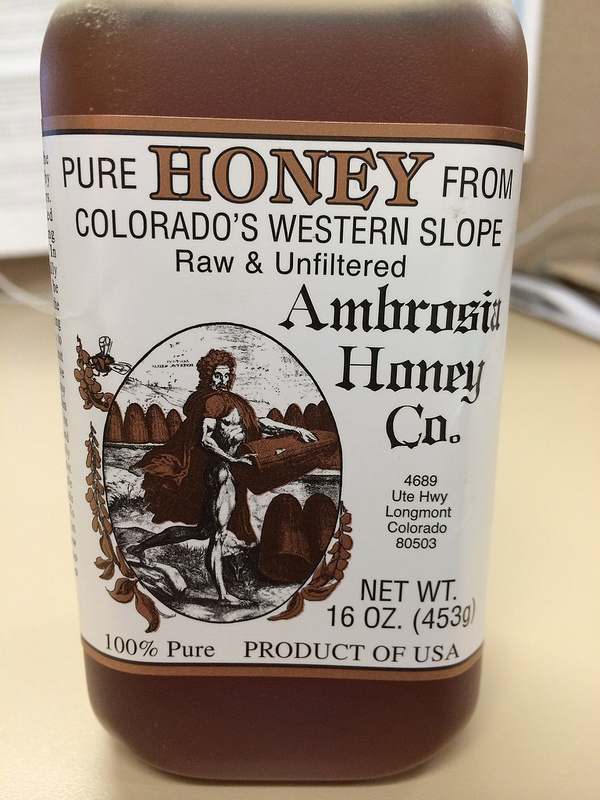 So there are some things I definitely enjoy about the packaging of this honey product (and some I’m not such a big fan of). I like to focus on the positive, so let’s get started. What’s I’m referring to is its testimony of being 100% pure. Obviously many consumers would make a purchase based on this, and I think it’s important to highlight that. Delivering on the promise of a “holistic” product. While I’ve never spent any significant amount of time in Colorado, what I do know is there are a lot of health-conscious, environment, well-being companies and citizens living there. The fact that this company is based just outside of Colorado really really speaks to its intent to provide a solid pure experience. The guarantee of a local, “homeland” product. It’s made in the USA. Hey – this is really important to some folks when purchasing any sort of consumer packaged goods. One thing I don’t particularly really care for is the use of various font types (none of which I really care for). I also think there’s a hell of a lot of going on on the label, and it’s very confusing to the consumer. And lastly, I can’t figure out what in the world the man is doing. If you have any insight please feel free to share. If you’re interested in finding out much more about this company and the items it offers, check out MadhavaSweeteners.com. You can also purchase your own products to try in the Madhava online store (not an affiliate link). You can also give ’em a like over on Facebook. What do you think about this package, honey?